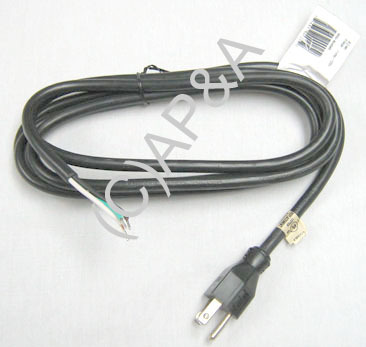 9-foot long power cord, black, with grounded 3-prong plug end (wall plug), and bare wire leads at the other end (game end). Heavy-duty 14-gauge 3 conductor stranded copper wire inside. Ideal replacement for commercial pinball machines and video games where line cord is wired directly to power supply or interface box. Adequate length for most games, or cut-to-fit as required. For use on games that use 120vac power, North America plug/receptacle. Replaces Stern # 515-6566-00. A grounded cord is essential for any electronic pinball or video game. Is your cord missing the ground lug? Replace that damaged, taped-up, or otherwise worn-out old cord with a brand new unit!